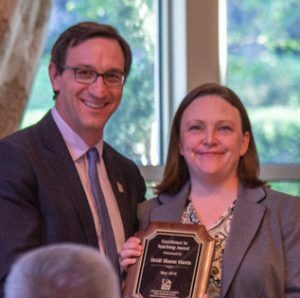 On May 1, the College of Social Sciences and Communication hosted the 2018 CSSC Awards Ceremony at the Governor’s Mansion. 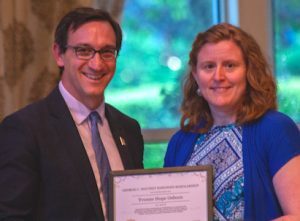 Dr. Heidi Harris was awarded the 2018 Teaching Excellence Award. Dr. Harris teaches technical writing and nonfiction and coordinates the Graduate Certificate in Online Writing Instruction. 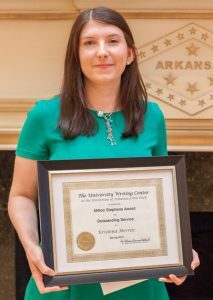 She has served on the Conference on College Composition and Communication’s Effective Practices in Online Writing Instruction Committee, and she has taught mostly online classes at UA Little Rock since 2013. 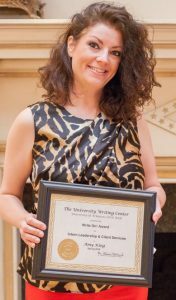 Her research on online writing instruction and faculty professional development has been published in six journals and five edited collections, and she is the lead editor of the Bedford Bibliography of Research in Online Writing Instruction. “I am honored to be nominated by my colleagues and proud to represent the Department of Rhetoric and Writing for the college and university,” Dr. Harris said. Keely Reeves with Dr. Sally Crisp and Dr. Huey Crisp, emeritus faculty in the Department of Rhetoric and Writing. Keely Reeves received the David and Lucille Chandler Scholarship, which was endowed by emeritus faculty Dr. Sally Crisp and Dr. Huey Crisp. 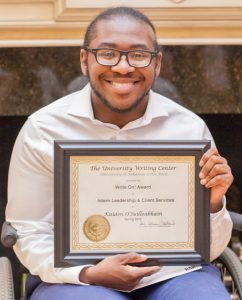 This scholarship supports a junior or senior student of exceptional ability who is majoring in technical and professional writing. 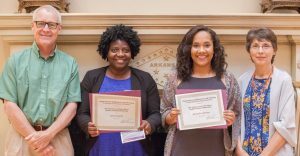 Koby Dapaah (not pictured) and Alexandria Barnes received the Clarence Albers Quality Writing Scholarship, a graduate scholarship awarded to the students pursuing nonfiction writing and editing. Emeritus Faculty Dr. Charles Anderson and Ruth Anderson endowed this scholarship. Dr. Julien Mirivel presents Hope Osborn with the Douthit Scholarship. 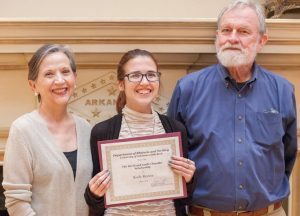 Hope Osborn and Melissa Johnson (not pictured) received the George C. Douthit Scholarship, which provides internships with Arkansas Public Media where students will produce news stories of local interest for radio and online media. 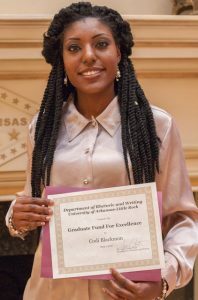 Codi Blackmon received the Graduate Excellence Award. 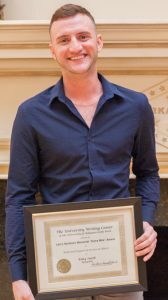 This award honors graduate students who have demonstrated excellence in their studies in the Masters Program in Professional and Technical Writing. 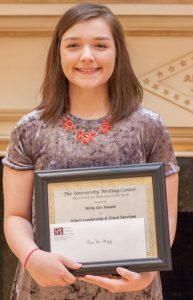 Amy Rhea (not pictured) received the Luis Gabriel Award for Outstanding Long-Term Service, the oldest and most important award the University Writing Center gives to a graduate assistant. 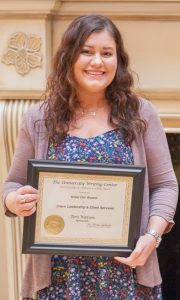 Kristena Merritt received the Milton Stephens Award for Outstanding Dedicated Service to the Writing Center by a graduate assistant. 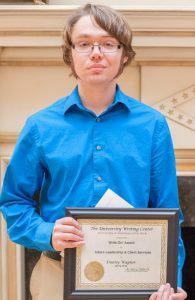 Riley Smith received the Larry Henthorn Extra Mile Service Award, given to an undergraduate who goes above and beyond in their dedication and service to the University Writing Center. Seven students received the Write On! 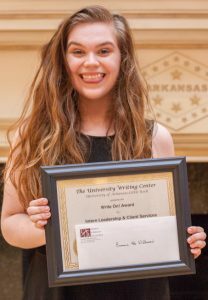 Awards for University Writing Center service. 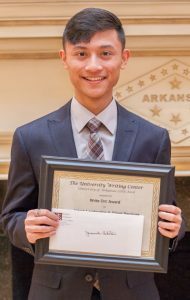 These undergraduate award winners are recognized by their peers for their service to clients. Congratulations to our 2018 Department of Rhetoric and Writing and University Writing Center Award Winners!